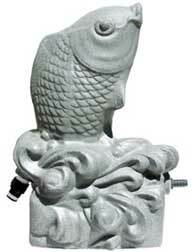 UV lamp surrounded by a quartz sleeve is concealed in these high quality UV resistant polyresin statuaries. Each has two 3/4" inlets (front and back) to allow for placement at any angle. 3/4" outlet, 2" cleanout on bottom. 24" Tall; measures 16 x 11-1/2". As a sterilizer: Max pond 200 gal; max flow rate 642 gph. As a clarifier: Max pond 1500 gal; max flow 1000 gal. As a sterilizer: Max pond 500 gal; mas flow rate 700 gph. As a clarifier: Max pond 2000 gal; max flow rate 1800 gph. As a sterilizer: Max pond 1200 gal; max flow rate 1200 gph. As a clarifier: Max pond 4000 gal; max flow rate 2000 gph.